I’ve heard it said that the working partnership between Pola Negri and German director Ernst Lubitsch succeeded because of Lubitsch’s eye. Specifically, his ability to “frame” Negri; containing her energy and redirecting it, so as not to sacrifice the whole to her part. To claim Negri’s performances—her Negri-ness—needed framing is to say much. It is to acknowledge, first, that she cannot be ignored; and second, that her magnetism created artistic limits on-screen. Leave Negri untouched and everything around her disappears. Which is not so good, if something around her was worth keeping. Aleksander Hertz, director of The Polish Dancer, did not have this insight. At least, not in 1917. The Polish Dancer is not a good film. It was, however, the first feature ever filmed in Poland—which is reason enough to watch it. Another reason: it exemplifies, in one early scene, what I’ve just described. I think the effect of this scene is accidental, or at least, the product of unsure direction; but, the result is the result. “Pola” (played by Negri) is the wild only-child of working-class Polish parents. Her mother dotes on her but her father is furious—Pola parties too much, has too many boyfriends, spends too many nights away from home. How does this make the family look? Cut, immediately, to a scene of Pola on a riverbank, surrounded by boys. (Actually, a cluster of girls within a larger cluster of boys; though you won’t notice the other girls unless you do so deliberately.) Everyone’s boozing it up. The girls lean back and laugh and raise their bottles; throwing their arms around the boys’ necks while Hertz, no doubt, shouted at them to look like they were having fun. The actors are trying. Pola, though, is doing. She’s the focal point of the scene, despite no help from the camera. Everything’s in long-shot and she’s not in the centre of it and yet, it’s Pola we watch: flirting and teasing the boys, stomping across the turf, hauling people to their feet, tumbling into her boyfriend’s lap. She pours a drink like it’s a major deal—drunk people do things that way—and shoves it in someone’s face. It couldn’t be more clear what Pola the character—and Pola the actress—are capable of. What the director was capable of, based on this film, anyway, is less clear. The Polish Dancer is a crude effort, exploiting a theme of debauchery already cliché in 1917. Its characters are broadly drawn archetypes, but the film lacks the powerful atmosphere or clarity of message needed to make them work. And at only 43 minutes, it isn’t long enough to develop them into something more. It is funny, but not always on purpose. Negri claws her way through scenes. Her Pola leaves hearth and home behind; seeks work as a model, then dancer; becomes a stage sensation. One evening, she’s discovered by an older patron (Witold Kuncewicz), who falls in love with her and abandons his family. Theirs is a decadent relationship, existing only so that the movie can tell us it should not. But it does give us one sensitive moment—one that Negri’s not even part of. Kuncewicz, filmed in medium shot, sits at a table; drinking and smoking. He’s in a pub; his wife and daughter wait at home. He’s thinking about the course of his life. He sets down his shot glass and fills it again, studies the table and blows a cloud of smoke over it—over the full glass and the bottle. He removes his hat and rubs his head and drinks some more. In this moment, you see the man’s vices—and the way they pollute him; the way they consume him as he consumes them. He feels real. So, there’s that. I can’t recommend The Polish Dancer, but I can recommend moments in it. 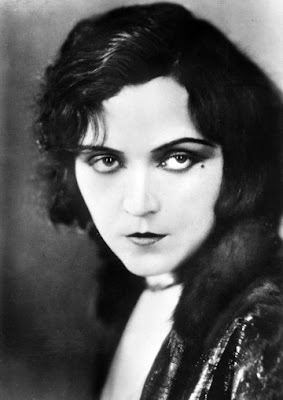 For Pola Negri fans, in particular, it should matter. It is an artifact from the earliest years of the career of a star. And an unrefined sample of the “it” that made her great. 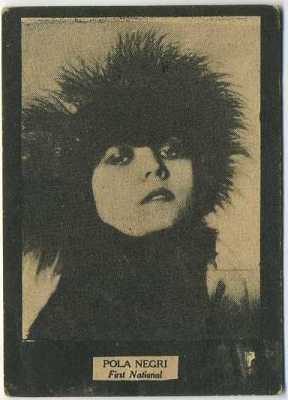 The Polish Dancer (Niewolnica zmysłów) can be found on Disc One of Bright Shiny City Productions’ three-disc set, Pola Negri: The Iconic Collection (The Early Films). The set includes three other Negri silents: The Yellow Ticket (1918); Eyes of the Mummy Ma (1918); and Sappho (1921); along with a photo slide-show and musical clip from one of Negri’s many successful sound outings: Tango Notturno (1937). Negri was an accomplished singer. Bright Shiny City Productions also distributes Pola Negri: Life is a Dream in Cinema; a worthy documentary on the star’s life. I watched it and learned a lot about an actor whose work should be better known. This is great. I've always been tepid towards Negri (and I honestly have no idea why); this gives me the kick I needed to get some of her work. The Negri I know is the wild girl from the Lubitsch period, but she was far more versatile than that. The documentary explores her career in depth. I recommend it.